Wow! 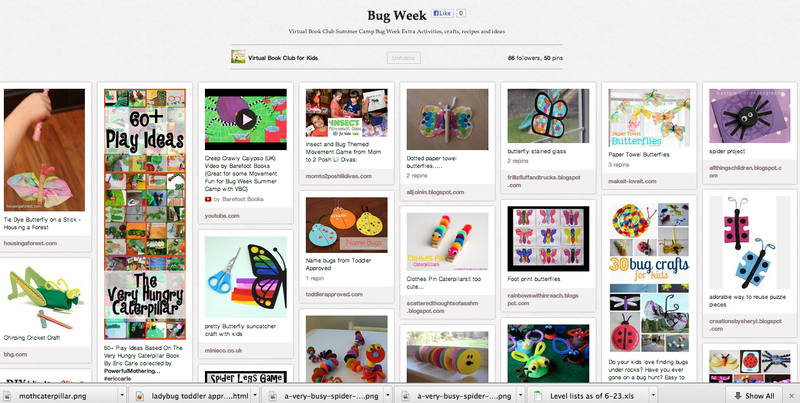 Can you tell we've been having fun during our Virtual Book Club Summer Camp Bug Week? The Educators' Spin On It, Rainy Day Mum, and I have been finding all sorts of ways to embed BUGS into our learning and playtimes this past week. 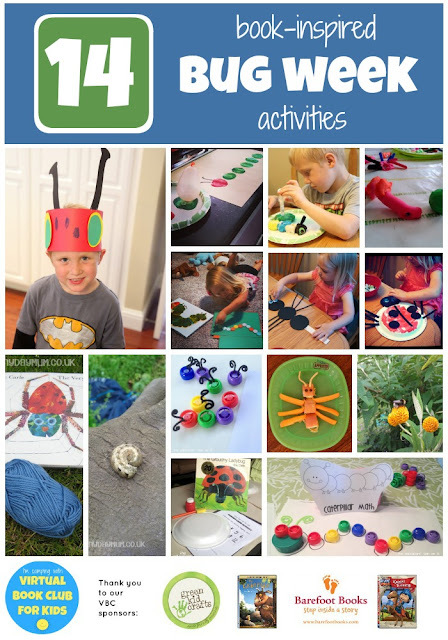 Here are 14 book-inspired bug week activities that we've shared over the past week! Click on each link for more details about the books we shared and how to do each activity. 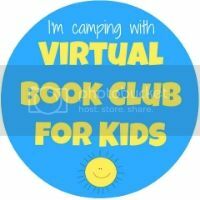 In addition to sharing about bugs on our blogs and on Instagram (you can find me at KristinaToddlerApproved at Cerys at RainyDayMum), we have also been pinning ideas that we've found to our Virtual Book Club Summer Camp Pinterest Board. Here's a sneak peak below of some of the ideas we've been collecting so far... and we'll be adding more and more as camp continues. We also have a board specifically for Bug Week if you want more ideas for your creepy crawly loving kids. If you've done any bug themed activities this week, come share them on our VBC Facebook wall or tag them with #vbcsummercamp or #bugweek and we'll come check them out and share them! If you aren't subscribed to our VBC Summer Camp Weekly Activity Planners yet, you can click here to sign up for Summer Camp! As a bonus for our VBC Summer Camp "campers" we have two great giveaways arriving in this week's activity planner! All email subscribers can enter the giveaways from Green Kid Crafts & NurtureStore. This week we have TWO giveaways from some of our sponsors and partners! Make sure to read all of the information below before you enter each giveaway. For detailed giveaway rules, please refer here. For Giveaway #1 we are giving one lucky reader a copy of The Garden Classroom by Cathy James. For Giveaway #2 we are giving away one annual subscription to Green Kid Crafts. Value $219.95. Your child will receive a special delivery of 3 to 4 exciting projects connected by a new and exciting nature theme each month. They'll also receive a Discover More guide with additional thematic activities and reading suggestions, plus fun bonus projects like coloring sheets, games and other goodies. This giveaway is for US residents only. Winners will be announced in next Friday’s camp activity planner. Only subscribers to the VBC Camp Activity Planner are eligible to enter these giveaways. Wow, you guys are so creative! And I really like the spider yoga! Last week was a ton of fun! We really enjoyed it!! We'd love to win the green crafts subscription! We joined for a month to try it and are excited to get our first box this month - gardening! How do we enter? Erin you can subscribe to our summer camp newsletter here http://rainydaymum.us5.list-manage.com/subscribe?u=3efaa538bbf2cf61dc998c1ad&id=5a95216724 The giveaways are linked in this month's newsletter which you will be sent once you subscribe. Let me know if you have any other questions!